I was watching The Today Show this morning and caught Martha Stewart’s segment on making Dutch Babies. It looked pretty easy and is a fun alternative to regular pancakes. Preheat oven to 425°. In a medium cast-iron or ovenproof nonstick skillet, melt 2 tablespoons butter over medium; set aside. In a blender, combine eggs, milk, flour, salt, vanilla and 1/4 cup sugar. Blend until foamy, about 1 minute. Pour batter into skillet (at this point, you can add cut fruit or chocolate chips in the batter); bake until pancake is puffed and lightly browned, about 20 minutes. Working quickly, dot pancake with 1 tablespoon butter, and sprinkle with 1 tablespoon sugar and lemon juice. Slice into wedges, and serve immediately. I wonder if this would work in a regular glass square baking pan. There’s a good chance I’m making these tomorrow for my boy’s 3rd birthday breakfast! Yes, you can make these in a regular glass pan. That’s the way our family does it all the time! My uneducated guess is that the blender adds air to the batter which makes it fluffy and pretty. I’m gonna have to give this recipe a try, looks delicious. I did a blog post this last summer on Dutch Babies as well. I’ve been making this recipe for as long as I can remember. It’s SOOOOOOOO easy. And they are so pretty. I usually make personal pans for each serving, but I’ve made them in a glass rectangle baking pan too. Here’s a link to my post in case you want to check it out. Happy 3rd birthday to your son! you can do it in a 9×13 and it will curl up the sides, or a 8×8 and you will get more curling. Michelle’s mom used to make these all the time growing up. Lemon and powdered sugar is the best or a small bit of jam. I make these a lot – my kids have grown up with them and call them “Monster Pancakes” because they are so big. 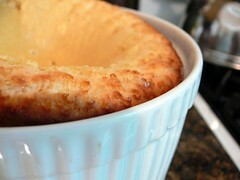 They work fine in a glass pan- I usually put the butter in the pan and put it in the oven while I’m mixing the batter. It’s melted when I’m done. We usually dust each of our pieces with powdered sugar and then squeeze a lemon slice over- yum. Plus the kids love to do their own. I bet they’ll become a new tradition for you!